First this isn’t the worst decision you’ll have to make, so if you’re deciding between Bryce and Zion because you only have time or resources to visit just one of these two top US National Parks, count yourself lucky. Many park visitors come from Salt Lake City or Las Vegas international airports, so that being said most traffic is coming from Northern Utah or Northern Nevada/Southern Utah. While Park traffic sees huge numbers of International traffic there is still great popularity amongst US citizens, and many locals. So the first step is looking into what your starting point is, this can save you valuable time and resources for your National Park excursion. So if you’re coming from northern Utah your choice would be Bryce, vice-versa if you’re coming from Northern Nevada then your choice would be to hit Zion first, thus saving you considerable travel time. If time and resources are not a factor in your decision you will then have to look a little deeper into the questions and answer. Have you been two one of these parks but not the other? If so please do yourself a favor and check out the National Park you haven’t yet seen, it will be well worth your time in either area. Next you will have to look into what type of experience you are truly looking for while visiting one of these breath taking National Parks. You will find similar things to do and area experiences in both locations, but the two parks are vastly different in what you will see. 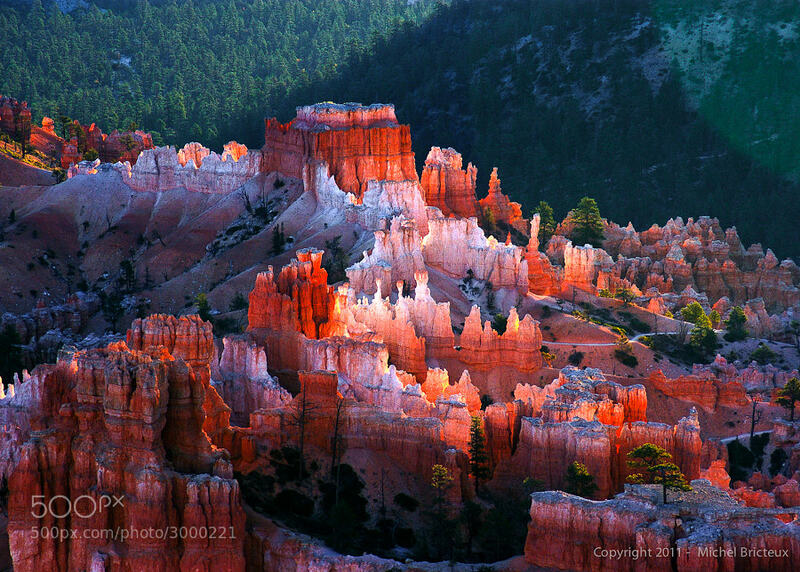 In Bryce Canyon you will see the famous hoodoos and split levels of this huge park. From the high desert floor to the tops of the forest covered Paunsugaunt Plateau, there is a lot of ground you will want to cover. The high mountain desert floor rises to the Ponderosa, Douglas and Cedar tree filled forest of the high Paunsaguant plateau. Depending on the time of year you should see Elk, Deer, Antelope, many different kinds of smaller animals and birds. Through the summer this park and surrounding area offers camping, fishing, hiking, biking and all other outdoor activities. Please take a look at: Bryce Canyon activities for a great starting point of things to do. There are many springs, creeks, rivers, pond and reservoirs that fill the park and surrounding country in Bryce. The trails you will find here that stand out from many other National Parks include Queens Garden, Mossy Cave, and the famous Red Canyon network. When you compare Bryce Canyon to Zion you will find drastic differences in the types of terrain and scenery. While both places are beautiful beyond description, Zion sets itself apart with a much more extremely complicated environment. Zion is full of famous slot canyons and extremely diverse elevation changes. Zion is a canyoneers dream but can prove to be extremely challenging from the average hiker. As of late there has been several tragedies from both hikers, rock climbers, and illegal base jumpers in Zion National Park. This is due to the technical and extremely diverse rock formations and slot canyons. For some great ideas on area activities and things to do please click here: https://www.zioncanyon.com/things-to-do-in-zion-national-park. If viewing the native wildlife in the Parks is your thing, please have a camera ready because while in Zion you just might have a highly protected desert big horn sheep cross the road or trail in front of you. These animals are a very rare sight outside of this park but a common sight while visiting Zion. You may also see many different birds, mule deer, elk, squirrels and other smaller species of Western wild life. Zion and Bryce Canyon National Parks are vastly different even thought they are just a short 1.5 hour drive from each other here in Southern Utah. If you cant squeeze both National parks in to your trip or vacation, it is very highly recommended to revisit Southern Utah in the future to take both National Parks in. These two parks are both rated in the top 10 National Parks in the United States. To sum it up, there really is no wrong choice when deciding between these two Great National Parks. The only recommendation if you can’t see them both now, pick the one that gives you more time in the area and come back to revisit the other choice later on. https://www.brycecanyon.com/wp-content/uploads/2017/09/bryce-canyon-logo-Y-W-min.png 0 0 Paul Jewkes https://www.brycecanyon.com/wp-content/uploads/2017/09/bryce-canyon-logo-Y-W-min.png Paul Jewkes2014-04-18 18:30:072017-09-22 20:34:40Should You go to Bryce Canyon or Zion Canyon? Hi. I will be visiting the area next february, and being winter, was wondering wether it will be difficult to acces these parks or not. I will only have one day (I will be coming from Page), so I was planning on going to Bryce first, spend some time there and then go on to Zion, have a look and sleep there: will I have enough time (sun will set early at that time)? or should I try to spend more time in either one of them? thanks! Interesting, the article is which of the two parks should you visit if not enough time for both. Read the article to find out: Both! Great, now change the name of the article.